Not long ago I was behind an elderly woman at a fast food snack bar and overheard her order to the teenage boy working there. Listening to what went on between the woman and the boy was a funny and curious example of the generation gap and the slang that has grown up around food and food orders. The woman wanted a hot dog. Easy enough, until the boy asked what she wanted on the hot dog. “Give me the works,” she answered. For a few beats the boy stared blankly at the woman and then, as if she had not heard his question, repeated, “What do you want on your hot dog?” The woman looked at the boy as if he were an idiot and barked, “The works, I said! Give me the works!” Flustered and totally in the dark, the boy excused himself and walked over to the girl working in the kitchen. The woman looked back at me and asked, “What? What’s the problem? Am I speaking French?” The girl appeared in place of the boy and sweetly asked, “I’m sorry. What would you like on your hot dog?” Really put out at this point, the woman snapped, “What’s with you people? 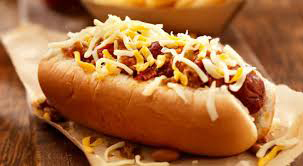 Do you understand English?” Figuring it was time to intercede, I leaned forward and explained that the woman would like to have everything on her hot dog, whatever relish, mustard or topping was available. Thinking later about this misunderstanding, I recalled a time when a group of us had a custom of eating Sunday breakfasts at a particular diner in Los Angeles. The diner (some called it a coffee shop) was a popular spot on La Cienega Boulevard called Ships that lasted from 1968 to 1996 before being torn down. It was one of those boomerang-shaped places with a futuristic neon sign that served American favorites at reasonable prices. 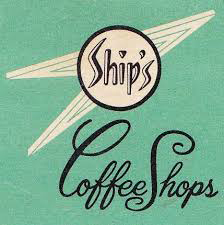 Most times we had breakfast at Ships we were served by the same waitress, a jolly, bustling woman with the diner-typical name of Thelma. Boy, did she have a colorful vocabulary of slang to describe their menu. Four glasses of orange juice was “a bridge party of OJ” and once when I asked for some syrup for my pancakes she told a passing bus boy to bring some “motor oil” to the table and to put some rollups (silverware in a rolled napkin) on table 12. It took us a few Sundays with Thelma to figure out only a small amount of the shouted slang passing between the waitresses and cooks. Food and the language we use to talk about it is often weird and interesting. American food vernacular was largely shaped by the working lingo of the waitresses and cooks in diners that spread across America in the 1940s and 50s and the earliest examples of their lingo go as far back as the nineteenth century. The men and women working in those diners used a vivid slang to communicate a customer’s order to the kitchen, expressions that were lighthearted, at times nasty, occasionally biblical and often just plain screwy, but in many cases served as mnemonic devices for cooks and staff. It may vary from place to place across the country, but you will rarely if ever hear this type of slang used outside the US. American diners are a purely American invention that grew out of the early twentieth century lunch wagons that roamed the streets in many New England cities. Owners of these lunch wagons eventually got the idea of making their wagons into stationary lunch spots that came to be called diners. 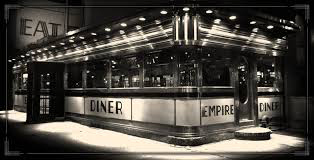 By the 1920s many of the diners began taking on an art deco look which by the thirties became modern and streamlined. The post WW2 years were a golden age for diners which saw interior decor with mirrored walls, stainless steel accessories, formica countertops in pink and beige, black and white checkerboard or tangerine and charcoal. By the late 1940s the American classic diner in all its curves, shiny chrome touches and glowing neon had arrived. Soon, customers were hearing shouted orders of, “A radio, a 51, a stretch and squeeze it!” code words telling the cook to prepare a tuna sandwich on toast, hot chocolate, a Coke, and to make it fast. Such colorful language has all but disappeared in this age when servers named not Thelma but Sage or Brittany, carry electronic pads with pictures and names of the menu items that in one touch communicate a customer’s order straight to the kitchen. And my personal favorite diner breakfast…a western omelet with French fries, or in the lingo of Thelma, a cowboy with spurs. As usual, wow! Can we thank the heat wave for keeping you indoors and at the keyboard? Fun, informative, and now I'm hungry. Reminds me of the days of Toddle House and the like, as near to diners that we had around here. I do have a feeling there are more diners in small towns than we know about. Americana for sure. With voice, text and data plans always start at £0.00/month.